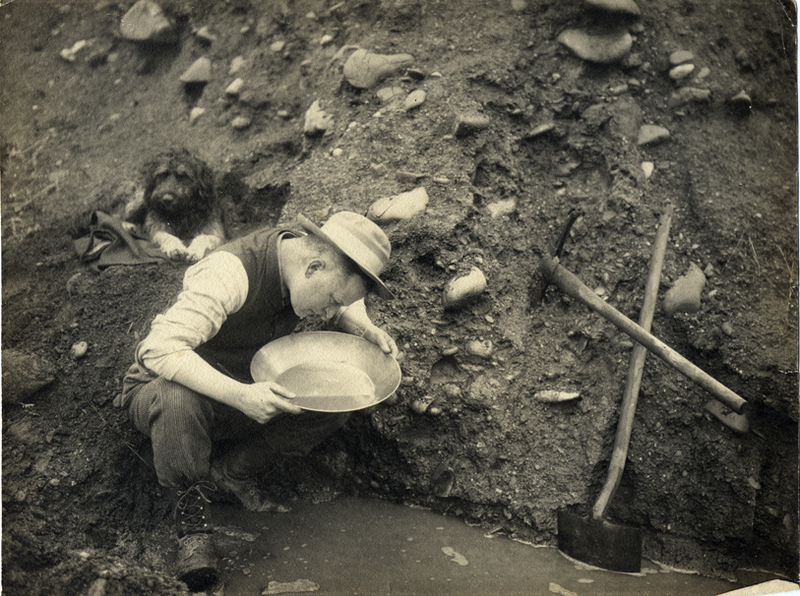 The second discovery of gold in California occurred in 1848 on the Trinity River at Reading Bar near Douglas City. By 1849, the California Gold Rush was in full swing and gold-bearing deposits were found along every major bar on the Trinity River. The combination of mild winters of 1850 and 1851 and shallow gold deposits located in the upper two to three feet of bar deposits made the use of pick, pan, rocker, and sluice boxes effective. As these shallow deposits were exhausted in the early 1850s and the weather became wetter, more intensive mining methods were employed, including water wheels, wing dams, and diversion dams. Water wheels, as large as 50 feet in diameter, acted as primitive dredges delivering gold-bearing gravels and water to mercury-lined sluice boxes. Wing dams were placed at the head of river bars to dewater one side of the bar to allow mining. Once one side of the bar was mined, the wing dam was moved and the other side of the bar was mined. Diversion dams fully spanned the Trinity River and diverted the flow into raceways and flumes to completely dewater the mainstem to allow for mining. Diversion dams were built near Junction City, Weaver Creek, Big Flat, and Lewiston. Diversion dams were expensive to build and temporary, washing out with the winter storms. The largest and most famous of these was Arkansas Dam, built in 1851, four miles upstream of Junction City. After the dam washed out in the winter of 1851 and again in 1852, it was rebuilt so substantially as to withstand not only the winter storms but also contain an upstream dam break flood that occurred when the 14-foot-high diversion dam at Union bar gave way. The ensuing flood wiped out every water wheel, dam, and other structures along the river in the intervening 20 miles between the dams. In 1857, Arkansas dam was removed by the miners so they could reach the gold deposits beneath the dam. Construction of water wheels, wing dams, and diversion dams was labor intensive and expensive. These forms of mining were becoming less profitable by the early 1860s as the gold deposits available to these methods were mining out. This era of placer gold mining ended in the winter of 1861-62 when major flood on the Trinity River washed out every flume, mine, and bridge on the river. Ground sluicing and hydraulic mining became the dominate form of gold mining in Trinity County after the 1862 storm. A very good source of information is the Trinity County Resource Conservation District‘s “Searching for Gold in Weaverville“. 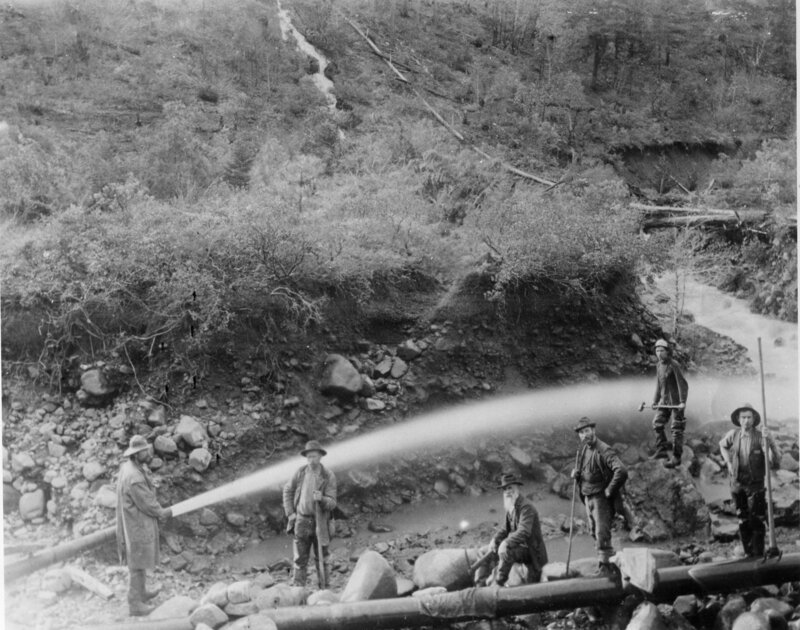 For years, Weaverville was one of the major centers of gold mining in the Klamath Mountains. The area was settled soon after Major Pearson B. Reading’s gold discovery on the Trinity River in 1848. The town was named for John Weaver, a prosperous Forty-Niner. By the middle 1850s many persons lived here, including several thousand Chinese, some of whom became involved in a tong war in 1854. The old Chinese Joss House still stands and is now a state historical monument. Mining began with small-scale placer operations in the Trinity River basin. Later the terrace and channel gravels were worked by hydraulic methods, and huge dragline dredges were used near Junction City and Weaverville. Total gold production of Trinity County from 1880 through 1959 was 2,036,300 ounces, mostly from placers. The central part of the Trinity County is traversed by a northwest-trending belt of schists belonging to the Abrams Mica Schist and the Salmon Hornblende Schist, both believed to be Precambrian in age, and concordant Paleozoic metasedimentary rocks including quartzites, cherts, slates, limestones and inter-bedded lavas, greenstones, and amphibolite schists. Northeast of this sequence of metasedimentary rocks are large masses of intrusive rocks ranging in composition from granite to serpentine, of probable Late Jurassic age. Sedimentary rocks, possibly equal to the Franciscan Group of Jurassic age, are exposed in the southwestern part of the county. Today, the hardrock mining industry owns gold, silver, and other precious metals and minerals beneath an estimated 21,632 acres of U.S. public land in Trinity County. Much of the land was acquired for as little as $0.84 per acre and held in perpetuity for a yearly rental fee as low as $0.62 an acre. Under a 132-year-old law, originally intended to spur development of the West, the industry is dominated by a handful of multinational corporations pays no federal royalties. The Carrville district is about 5 miles north of Trinity Center, along the Trinity River near its junction with Coffee Creek. Almost its entire production has come from lode deposits, which produced an estimated $1 million in gold through 1910 ; however, no activity has been reported in recent years. The Trinity River basin is a large area that includes most of the drainage of the Trinity River, and it extends from Coffee Creek southward through Trinity Center, Dedrick, Helena, Junction City, Weaverville, Lewiston, and Douglas City, and west to the Hay Fork area. Mining began in this area in the early 1850s and was still active in 1959, though on a much-reduced scale. Placer mining was formerly done on a large-scale by hydraulic operations, but large dragline dredges have supplanted the hydraulic giants. The La Grange mine near Weaverville was the largest hydraulic mine in this area. Production of gold from the gravels of the Trinity River basin from 1880 through 1959 was about 1,750,000 ounces. The gold-bearing gravels of the Trinity basin are related to two cycles of erosion of the Klamath Mountains. The older gravels are partly cemented and locally deformed, where the younger gravels occur along the present streams and are undisturbed. Both types contain workable placers. The Cinnabar District is above Trinity Center, about sixty miles from Weaverville, Trinity County. The Trinity and Altoona are the principal mines, and have generally been profitably worked. The cost of producing quicksilver in this district was 17 cents per pound. The Altoona quicksilver mine had a force who are engaged in getting out ore and developing the ledge.